In 5E, whorl is related with AIR element and TA to FIRE element. In Unger's system, whorl is related to FIRE element, while TA to AIR element. Hence, more than 6 whorls belong to school of service. more than 3/4 TAs belong to school of wisdom. Such a significant difference betweent interpretation of whorl and TA!? Or I have missed something here? I think it is - loop with central tri-radius is treated as Loop + TA and not totally TA, if I not wrong.But, yes, the treatment differs!! I wonder, which source did you use regarding Richard Unger's system? Thank you sharing this resource Martijn. I have Janet Savage's .pdf material. "Jacquin is a giant in the world of hand reading and besides his compelling personal history and multitude of published works, he appears to be the first Western professional hand reader to offer a comprehensive system of fingerprint interpretation. As noted, he equates arches with earthy personality characteristics, whorls with individualism (fire), etc." "I would like to list then my disagreements with the Jacquin system (acknowledging my debt of gratitude for his being first in this area and his many other important contributions to hand analysis)"
So, to me it appears that Richard has presented a very confusing response... because Jennifer uses the classic principle whorl = air, then Richard suggests that Jaquin's work says: whorl = fire... which would implicate that Jaquin's work could not represent the basis of the classic fingerprint principle at all - but Richard does suggest this! Actually, I have doubts about whether Jaquin has made any connection between the fingerprint types & the elements at all... because Jaquin's latest books were written in the late 50's (1956 - see: http://www.cheirology.net/history/jaquin.htm ), which was well before the elements had entered the field of hand reading via the work of Gettings! By the way, I also don't understand Richard's assumption regarding fire = individualism... and I can not exclude the possibility that Richard is projecting his own assumption about this to Jaquin's work. PS. I am also aware that in Richard's work the ring finger gets associated with 'individuality' (I was informed by Janet about this); but to me this principle is quite unusual because in most books about hand reading the I/self/ego actually get associated with the index finger (or thumb)! And now that I noticed that Baeth Davis and other IIHA students are using a different principle than Janet & Richard appear to use... I don't understand the origins of this contradictive communication about fingerprints between the IIHA staff (Richard & Janet) & the IIHA students (Baeth & the other student). Re - Jaquin's work: Richard says he started it in 1920's!! Re - Fire being individualism, I have heard Richard's other audios(The ones available in Jena's site particularly on the handshape and fingers). The audio link is still there.Though, it was a long back, I am sure, he associates it persona too. "May be" the term "individualism" he meant, how the person wants to stand out, get appreication and acknowledgement. Did Janet describe anything more in detail about the individualism? This is the first time I am coming across the difference between elemental association between what Unger teaches(Janet) and what Beath teaches. However, both of them do associate 'school of wisdom' service' to high number of whorls(6 or more). In that way, Beath seems like in agreement with Richard. In that article, what Richard says as - The finger prints have to be taken not in isolation, but, together was a good point, like the way we use the hand markings together. I have Richard's book "Life Prints" but can't find where the elements are even mentioned. I think only the 5E system take the elements so seriously in their use with hands. Personally, it seems a mistake to limit the indications of a fingerprint pattern to a single element's definitions. I feel the same toward any part of the hand actually. People need to be 'on the same page' when working with assigning such things. The elements have broad interpretations. Rarely, if ever, is an element found alone and made of only itself. So, whoever is assigning an element to something is likely naively looking at the element and the something in its mixed form and offering their best biased opinion. How else would you explain the contradictions? I currrently have Ronelle's 'Destiny at Fingertips'. I didn't see the elemental assignment there too. But, as I have mentioned earlier in this post, Janet Savage have mentioned in in one of her .pdfs and Martijn has found it in Beath's site. These AIR/FIRE are the terms used in Janet's and Baeth's materials for association. And using them, just places WHORL and TA in to certain categories(though not in pure form as you say ) of meanings and we can discuss further on it. But, the point here is the differenence in interpretations assigned to WHORL and TA and not about 5E's terminologies. The interpretations that are ascribed to TA by 5E are given to WHORL in RU's system and vice-versa. Even if you take, more than 6 whorls: This is associated with school of service and more than 3-4 TAs is associated with school of wisdom! I recall from the (now deleted ) Handreading Cyber Cafe days that Christopher admired Richard's work and efforts in designing his system and putting out a newsletter, but had disagreement in regards to content. I think it's possible that Richard was inspired by Jacquin's deep interest in the forces at work behind the individuality of the fingerprints. In "Secrets of Hand Reading" (pages 63 & 64) Jacquin writes "After a long period of observation and a great deal of detailed work, I was forced to the conclusion that these ridge pattersn possess a vital psychological significance. I came to the conclusion that there is little doubt that they betray certain inherited basic psychological factors upon which individual character is founded, and which determine the type of complex processes that guide individual human activities. Having made many elaborate and involved tests of this theory, I now have no doubt that these ridge patterns are unconsciously formed by the forces that determine the actual elasticity of our diagrammatic picture. They mark, or determine, the boundaries of individual emotional responsiveness. 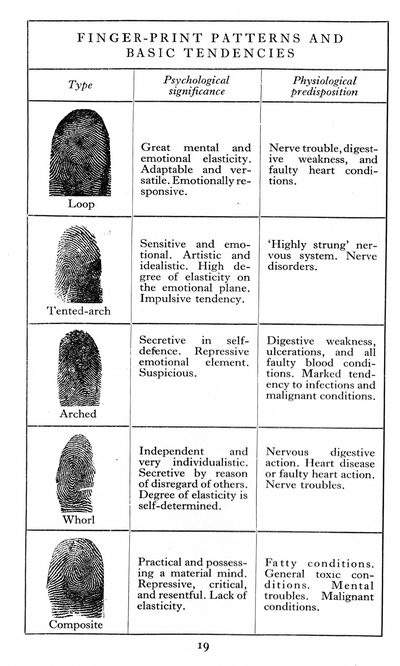 There is no shadow of doubt that a great deal of psychological data can be deduced from these finger-print designs alone." Kiran.Katawa wrote: Re - Jaquin's work: Richard says he started it in 1920's!! This is the first time I am coming across the difference between elemental association between what Unger teaches(Janet) and what Beath teaches. However, both of them do associate 'school of wisdom' to high number of whorls(6 or more). In that way, Beath seems like in agreement with Richard. Yes Kiran, Jaquin's work covers the 20's to 50's (my point was only that I doubt whether Jaquin has spoken about the elements in his work... because the elements were sort of introduced in the field of hand reading by Gettings in the 60's). Regarding Janet, she informed me that she indeed associates 'individuality' & 'persona' with the ring finger, and she associates 'personal power' with the index finger + 'I want' with the proximal phalange of the index finger. By the way, in Richard's book it appears that in various chapters he only defines 'school of wisdom' via the tented arches; Kiran, did you made a writing mistake in your post above by linking 6 or more whorls with 'school of wisdom'? Then the next post is Richard's message to Mark....which seems, if I'm connecting the dots properly was the likely motivation for writing the article... as Richard points out, "The key, I believe, is that all ten fingerprints must be counted in tandem and the map revealed is not one’s personality style but one’s deepest meaning point". and Mark's opening words say that his approach is "Whichever fingers these glyphs adorn determine which qualities dominate corresponding aspects of personality." So, it looks like Richard's purpose was to point out the 'old-fashioned' way of reading individual fingers and prints as having any meaning was pointless, but I don't see why Jennifer's article was chosen. Well Patti, if you take a look in Ed Campbell's book page 111-113, then you will see that Jennifer's approach regarding how to link the 4 elements with the 4 major fingerprint types... actually represents the basis principle that was also presented in Ed Campbell's report resulting from an extended literature study (who used e.g. the works of Dukes, Hutchinson, Jaegers, Fairchild, Daniels Squire, and Fenton & Wright in order to describe the underlying details of the classical principle: arch = earth, tented-arch = fire, loop = water, whorl = air). I think Mark only shared Jennifer's article just to say that he can identify with Jennifer's approach (including the featured classical principle). And since Kiran refered to the IIHA... I thought it could make sense to share what Richard recently described (a few weeks ago in response to Mark's post) - which appears to confirm Janet's principle described by Kiran (e.g. tented arch = air, whorl = fire). However, unfortunately Richard appears to claim that his principle (= the principle described by Janet) is similar to Jaquin's ... but I have the impression that others probably perceive the classic principle to be representive for Jaquin's work. And then it becomes very confusing to notice that various IIHA students using contradictive principles. Anyway, I very much appreciate that Kiran has reported this apparent contradiction (between the classic principe on the one side, and what Janet + Richard reported on the other side - though... less other IIHA students appear to use the classic principle described by Jennifer & Ed; one could wonder how much Richard has talked about the elements in his basic teachings, because the elements are not mentioned in his book nor Ronelle Coburn's book). I think he's pointing out that Jacquin got it wrong although he was at first inspired by him. Martijn, yes, you're right. I have corrected it. Patti, Yes, the same thought occured to me last night. Richard wants to emphasize reading the fingerprints in whole and not on individual basis, which is followed by Jen. He might have navigated his thots via Jaquin's ideas, rather than contradicting Jen directly. It is just a 'may be' thot. But, could you guys make out, what Jen wanted to say- "In truth, there really isn’t much ‘offered in print’ about the profoundly user friendly five element system of hand reading, ‘the language of the elements’, at all. For the record, you, Cummins/Midlo and Jaquin are accredited in the bibliography of my book ‘God Given Glyphs’." Thank you Martijn. It is just that couple of days back I noticed this major difference and in this discussion, it is more evident that there is some differeing thots here. But, in general what do you all think about reading the fingerprints in combination? Yes, when they are more than 6 for whorls, 8 loops or 3/4 TA or A's then they are read in combination. But, do you ppl take any approach in combining the finger prints? Kiran.Katawa wrote: But, could you guys make out, what Jen wanted to say- "In truth, there really isn’t much ‘offered in print’ about the profoundly user friendly five element system of hand reading, ‘the language of the elements’, at all. For the record, you, Cummins/Midlo and Jaquin are accredited in the bibliography of my book ‘God Given Glyphs’." I think Jen was just saying that there are not many books about 5-element system (or about using 'the language of the elements' in handreading). Maybe she was subtly pointing out that Jaquin etc did not use the elements, so her use of elements makes her work different and rather unique in handreading books. Then lastly pointing out to Richard that she is aware of the sources he mentions as they are all credited in her book. Kiran, nice to see in your latest post that you recognize now as well that Richard's response to Jennifer's article raises quite a few questions. By the way, Ed Campbell's work suggests that Dukes elemental principles (arch = earth, tented arch = fire, loop = water, whorl = air) for the fingerprints are compatible with the works of many others. But I am not sure that this is actually true when one starts considering the details in a larger perspective. Though I think it is obvious that Ed does use the same principle that Dukes described. And for example: Beryl Hutchinson links the tented arch with enthousiasm - which is a typical fire-characteristics, and the whorl with the individualist - which is a typical air characteristics (Jennifer uses both principles as well) ... so at first sight it is hard to understand what makes Richard to link the 'individualistic' whorl with the elemente fire. The elemental principle of the graduated materiality suggests that the fingerprints should expect to have a likewise order where the order "arch - loop - whorl" should somehow be connected with the order "earth - water - fire - air". And since there appears to broad agreement regarding the nature of the arch fingerprint pattern being connected with earth and the loop fingerprint pattern with water... I think it could actually make sense to associate a single-core whorl with fire, and a double-core whorl (or double loop) with air. This would also solve some problems regarding the problematic nature of the 'tented arch', which by principle has quite a few different manifestation shapes... where some arch-like tented arches can get associated with earth and some loop-like tented arches can get associated with water... but all tented arches would then be described in terms of a combination of earth and water (with varying proportions). And a 'peacock' would then become a combination of water and fire - which appears very similar to the so-called 'flame' - which is already described in Dukes work as a combination of the water and fire! This is just an attempt to approach things from a fundamental point of view... which could explain why both the classic perspective and Richard's perspective could for the large part make sense... so the apparent contradiction could potentially have less dramatic implications than what one may think at first sight!! Kiran, I hope my previous (longer) response will become helpful for you to understand the nature of the contradiction from a more fundamental point of view. Looking forward to hear if you can recognize the fundamental significance of what I have described there regarding the principle of the graduated materiality! "As you no doubt agree, comparative topography is at the heart of hand analysis. Big thumbed peopled are thumb-ier than small thumbed people, etc. Without going into further detail here (more is available on the IIHA website: http://www.handanalysis.net) had Jacquin known this I am sure he would have altered his system of interpretation accordingly." Richard appears to have tried to improve things... and now I understand that he actually takes distance from Jacquin's perspective as well (I got confused by his positive words regarding Jaquin's work + Richard's suggestion that Jacquin had described the whorl in terms of air... which is not the case at all, because this connection was only made by later authors). However, earlier discussions have indicated that Richard's approach to the tented arch is rather dubious... and very susceptible to arbitrary subjective observations/interpretations (because Richard's so-called 'advanced' method for the tented arch can by principle only be applied to the hand directly because the rotation of the finger gets involved... which implicates that one can not apply this to fingerprints on paper - which Richard has confirmed to me about 3 year ago!). Unfortunately, I recognize how this leads to 'one step back' in the evolution of fingerprint interpretatation... because Richard's approach of fingerprint classicification regarding the tented arch is incompatible with the much more detailed approach used by the forensic fingerprint authorities, such as the FBI... which itself is 100% compatible with the common methods usually used in the field of hand reading! Sorry, I didn't get clearly as what you want convey. If I understand right, you're saying that: There is agreement regarding arch and loop b/w classic and RU's system. While the TA and Whorl are not treated the same in these 2 schools. So, assigning fire element to whorl and air to doulble loop would simplify the matter? Why? is it 'coz, the TA would appear as a "loop + TA" depending on the way I am holding the finger in front of me? and the same can't happen on a paper. But, Is it essential while reading the hands to get the accuracy of classifying the fingerprint to be of specific type when it is falling on boundary. As I understand, it is the approximate which is considered and the interpreations would go based on that. That's why in RU's system, it will just be based on the no. of tri-radii's and its positioning that is MAINLY used for the classification and ranking.